Apparently its September. I'm not really sure how that happened, but August is no longer. The summer seems to have flown by in a whirlwind of weekend getaways and summer produce -- as many peaches, cobs of corn and tomatoes as we could get our hands on. I refuse to bid adieu to my sun filled morning walks to work, the balmy nights that lure us outdoors, and the overall summer mentality. I'm not ready for hibernation. With that in mind, before all my recipes turn to apples, squash and pumpkins, I'll leave you with these zucchini and chicken burgers, holding onto the last bits of summer, while embracing the warm comfort foods that are slowly creeping their way in. Enjoy! In a large bowl, combine all the burger ingredients. Using your hands, mix until just combined, then shape into 8 evenly sized patties. Over medium heat, fill a frying pan with just enough oil to cover the bottom. Once the oil is hot, working in batches, gently place the burgers in the pan. Sear for 2 minutes, each side. Transfer to a paper towel lined plate while you fry the remaining burgers. Transfer all the burgers to a parchment lined baking sheet. Bake for roughly 15 minutes until cooked through. To make the sumac spread, whisk all the ingredients and set aside. 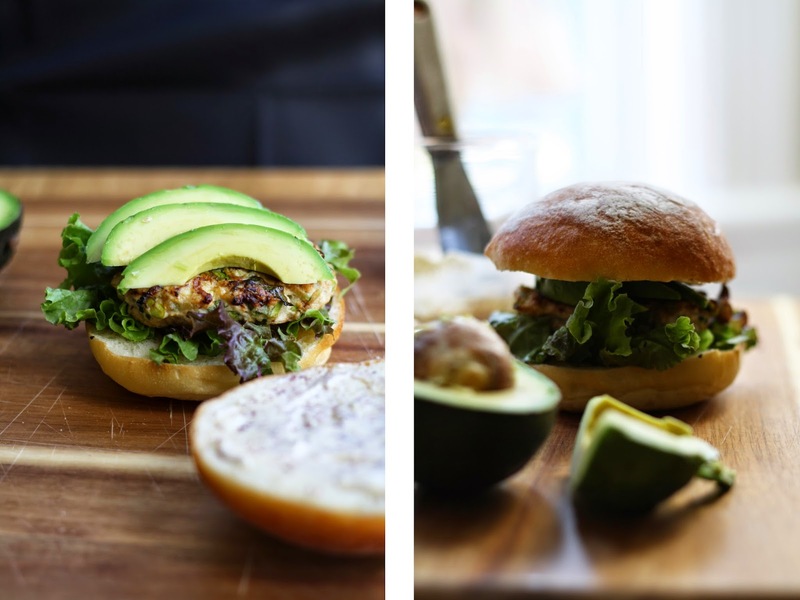 Serve the burgers warm, inside a bun stuffed with avocado, greens, and a slather of sumac spread. For a daytime lunch alternative, split the burger in half, and stuff all the ingredients into a collard green, wrap and enjoy cold.